(CNN) – A woman will be president in her lifetime, first lady Michelle Obama speculated in an interview this week, though she wouldn't offer a prediction on whether that woman would be Hillary Clinton. "She hasn't announced anything, so I'm certainly not going to get ahead of her," the first lady said, laughing, in an interview for Sunday's edition of Parade Magazine. The country, she added, was "ready" for a woman commander-in-chief, but, "It's just a question of who's the best person out there." One woman who definitely will not be the first female president? Michelle Obama. Asked if she'll ever run for office herself, the answer was a simple, "No." Clinton made history in 2008 by receiving more votes in the presidential primaries than any previous woman, though she eventually lost the Democratic nomination to Barack Obama. In the interview, Obama described how her husband's election altered Americans' sense of who could become president. "Children born in the last eight years will only know an African-American man being president of the United States," she said. "That changes the bar for all of our children, regardless of their race, their sexual orientation, their gender. It expands the scope of opportunity in their minds. And that's where change happens." And while she will never run for office, she did detail one small way her life in the public eye had changed her life. 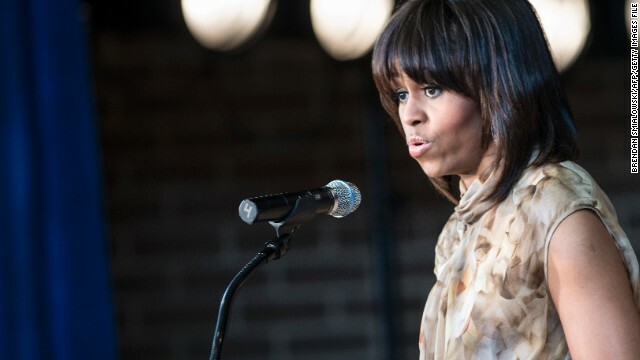 Asked why she ditched the bangs that caused such a stir earlier this year, Michelle Obama said, "You know, it's hard to make speeches with hair in your face!" I can sum this all up. 1. A Clinton run will be very formidable! She has name recognition, she has money, she had political experience! The idea that she could make history as the first female president is a strong pull for a great deal of potential voters! 2. The GOP IS nervous! 3. The key will be the independent voter and the economy! Plain and simple! While Benghazi would be a millstone to anybody else, I doubt that it will be to her (unless enough independents say otherwise). I blame all this speculation on the 24 hour news programs......when there is no news to fill their air time, they are forced to create news. It is often lame.........like speculating on who might or might not run for office 3 years before the election. But what are they going to do.........they have to fill their time slots. I believe that the majority of the electorate has been receptive to the concept of a female POTUS for some time ... but then Palin and Bachmann came along and gave the nation pause. II guess Hilly got over her Ben Ghazi nervous breakdown !!!! "What the clown did was ridiculous but I am awaiting the NAACP to say something about those three who beat up that one kid on a Florida school bus. Is the reason for the silence is because the victim was the wrong skin color?" Don't hold your breath, SteveO. Sadly, it's not coming. I won't Fair. The lack of one word of condemnation for the perps or a word support for the victim just exposes them! Michelle is Hillary's running mate in 2016. Steveo, I see that you are now focusing on who is carrying out a NSA program that was put in place, apparently with bipartisan support and court supervision, in the Bush administration. Do you blame the person who came up with the idea AND got the program up and running, or the person who is carrying out the program? Who deserves MORE blame? To answer you Bush cannot change anything as he is no longer in power. Truth is Obama can't change much either. But the Congress can! Keep in mind the, 2008-2010 version of Congress did little too! You looking for a 51%-49% split? I'm glad you're here, because you're a conservative who engages rather than name-calls. However, as a liberal myself, I'd actually prefer it if you argued the conservative side more often. Yeah, there's equivalence, but most of the time one side is wrong about something. It's like you have an addiction to equivalence, like to cigarettes. I'd like to hear why my liberal views are wrong! Cheers, DD.